The long-awaited finale aired yesterday. 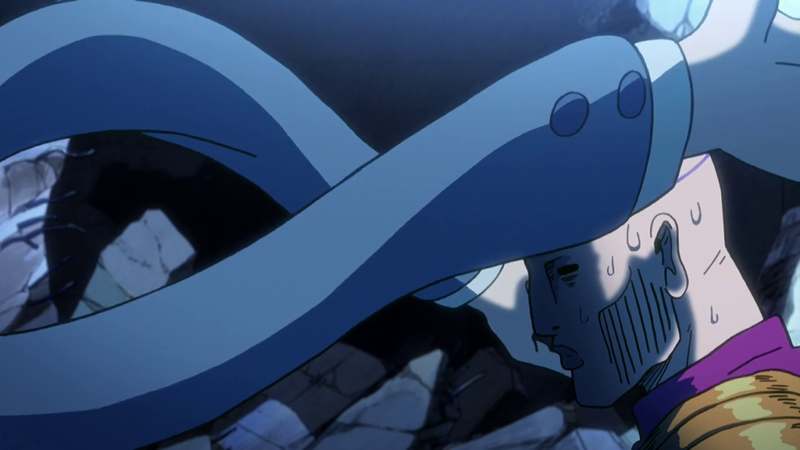 Like episode 10 a while back, last week ended with a misguiding cliffhanger that provided the audience a false lead on the following events; many viewers expected Mob’s emotions to explode and destroy the remaining Claw members in bombastic fashion, the awe-inspiring and frankly terrifying effect of such a powerful yet weak boy going on a rampage. 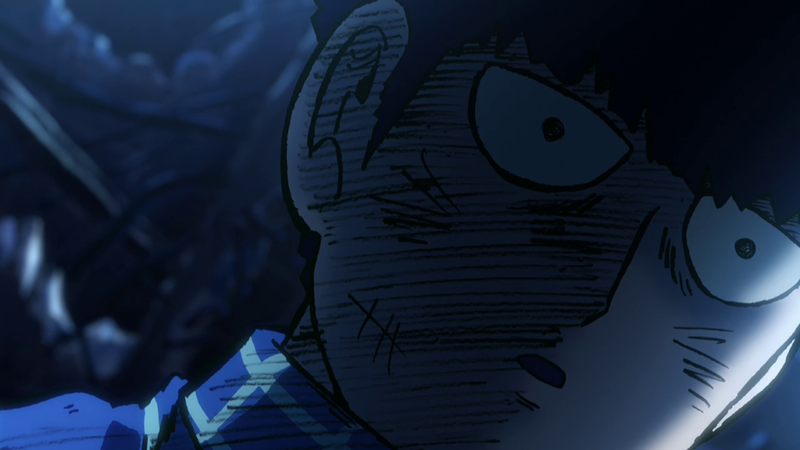 But it wouldn’t have been Mob Psycho if it hadn’t subverted those expectations! 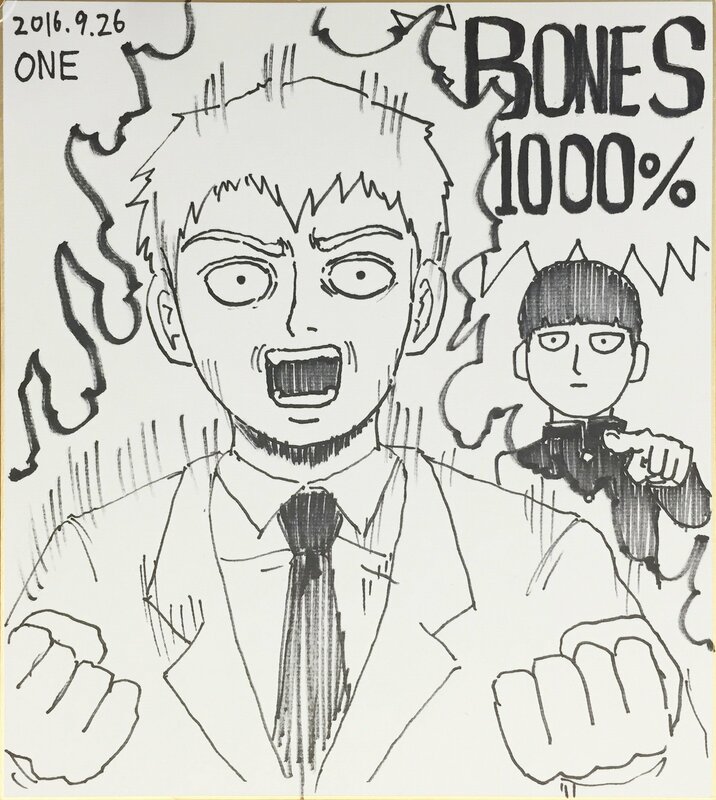 The showcase of dynamic and powerful action – with an excellent side dish of lively acting – that people were looking forward to did happen, but it was Reigen who got to star in it. 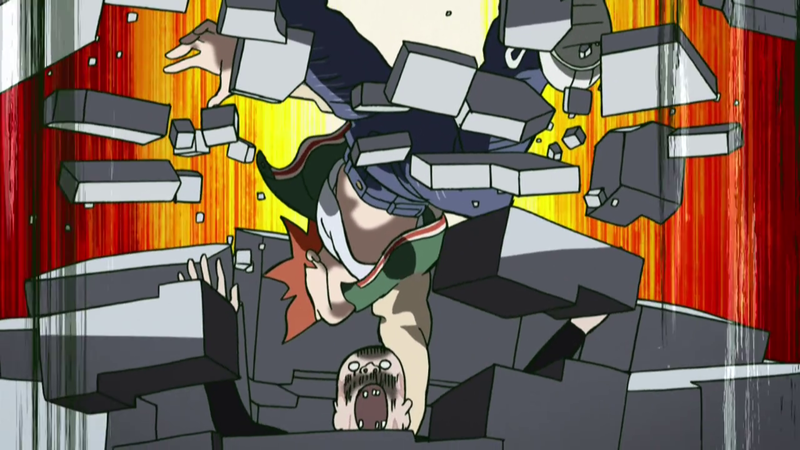 As was the case with Yoshimichi Kameda’s previous outing as animation director, the characters in this episode were almost constantly moving. 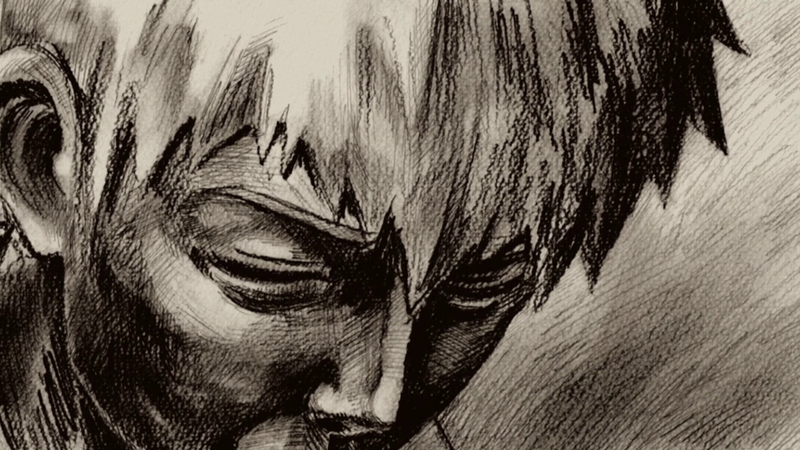 Whether it was during Reigen’s exhausting monologue in the first half, or the more subdued character moments in the second half, the effort Kameda and his team of key animators put into the less explosive scenes was really admirable. As time passes people tend to remember just the flashiest scenes from notable productions, but truly outstanding projects are equally strong if not quietly more impressive during uneventful moments. This aspect was truly where Kameda’s episodes stood above the rest of the already excellent series. The quality of the drawings, the rough lineart and the consistency with the designs were also magnificent. Shout-out to the very good character animator Kanako Yoshida for supporting him and handling part of the animation direction. Working alongside Kameda and doing a satisfactory job is no small feat! As one would expect, the series director Yuzuru Tachikawa storyboarded and directed the episode. It was his last chance to go wild with the series and surprise the viewers with interesting visual and storytelling ideas. He didn’t hesitate and bombarded us with constant striking shots, all while handling the tension very well. 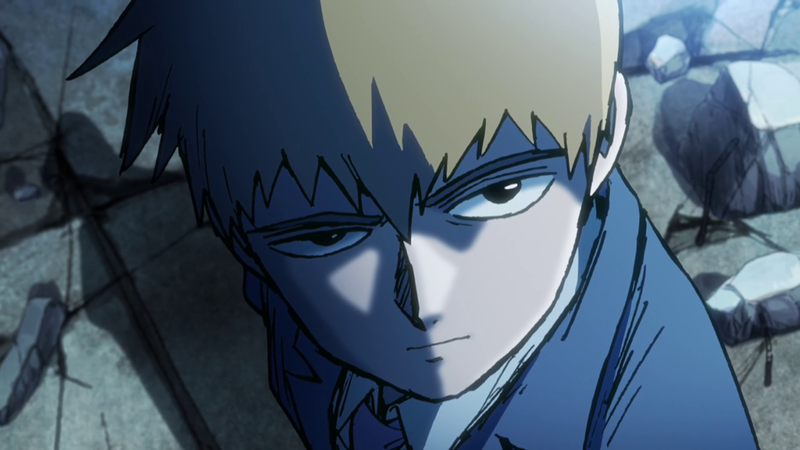 Reigen must be like a dream for inventive directors like him, as his character traits allow him to use lots and lots of creative angles without them feeling out of place or forced; these theatrics aren’t just flourish, they’re part of the persona Reigen wants to project. 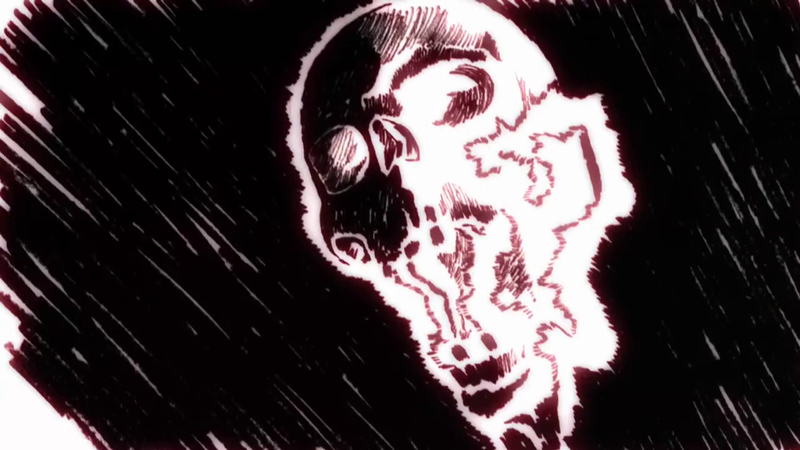 Miyo Sato’s paint-on-glass animation was also on the spotlight more than ever before, supporting the narrative by making the explanation of the power transfer more visually compelling than a static infodump would have been. 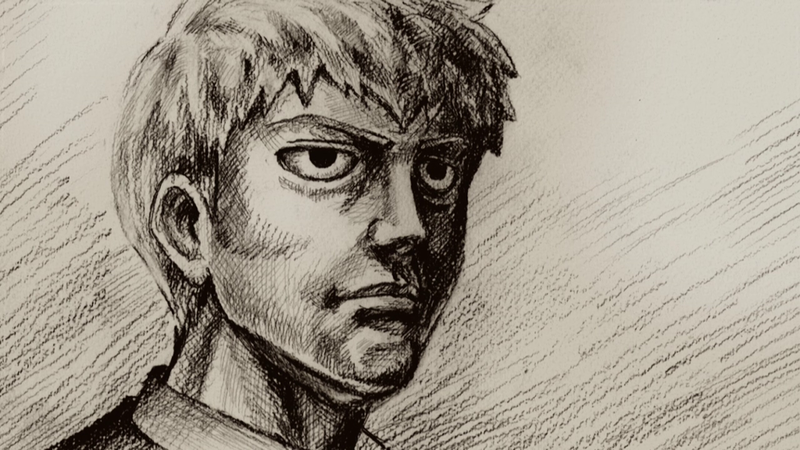 Even ultimately unimportant moments like Reigen comforting Sakurai about his tough childhood were elevated by the extremely detailed monochrome drawings, which helped it become one of the comedy highlights of the episode; this may be a serious episode, but the show isn’t afraid to turn anything into a gag – even if it means momentarily turning the spoiled brat of a villain into a literal manbaby. The most surprising idea this time around was the omake, though. A very peculiar way to end the series! A key animator, namely Toshiyuki Sato, was asked to emulate the original manga’s art and it was truly a sight to behold. The staff even changed the style of the background art making it a what-if kind of scene; maybe that’s what the entire show would have looked like had the staff decided to follow ONE’s source material extremely closely. Unfortunately, there’s a misunderstanding regarding this omake that I would like to address – it wasn’t ONE himself who animated it, it was a regular animator mimicking his style. 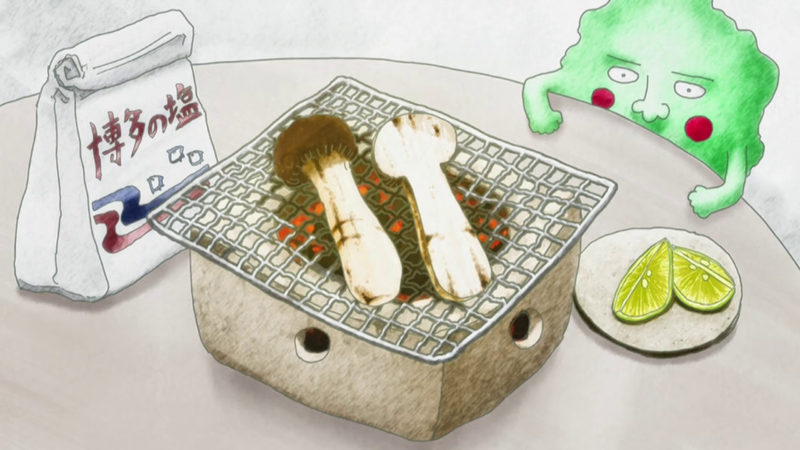 People keep bringing up that ONE was in the key animation credits, which is true, but that’s because he drew the very last still shot of Matsutake mushrooms. Thanks to BONES Photography Department’s Takashi Sawa for clearing this up on twitter! Now onto the animation highlights. 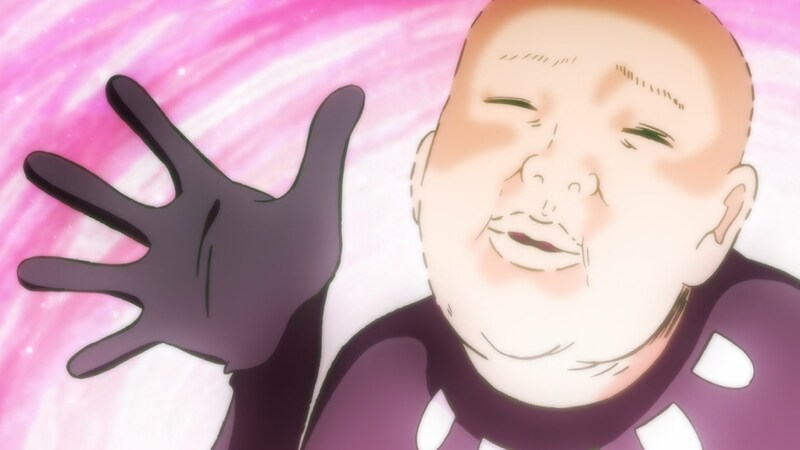 As there were many once again, I can’t possibly talk about all of them so I recommend checking the Mob Psycho tag on Sakugabooru. First I’m going to mention Shinya Ohira’s pupil Takuji Miyamoto; he appeared two episodes in a row, but it wasn’t until the finale that he truly showed his skills. 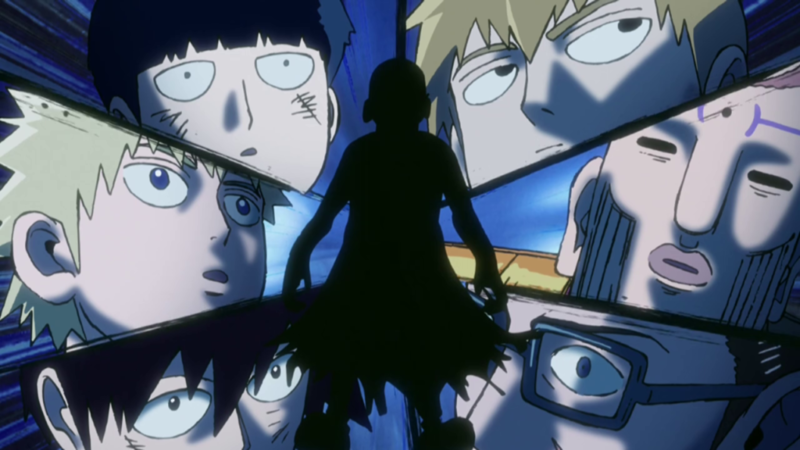 He presumably was in charge of the scene where Reigen gets rid of Muraki’s clones. It’s a piece of animation that even his teacher, master of abstract deformations, wouldn’t be ashamed of. 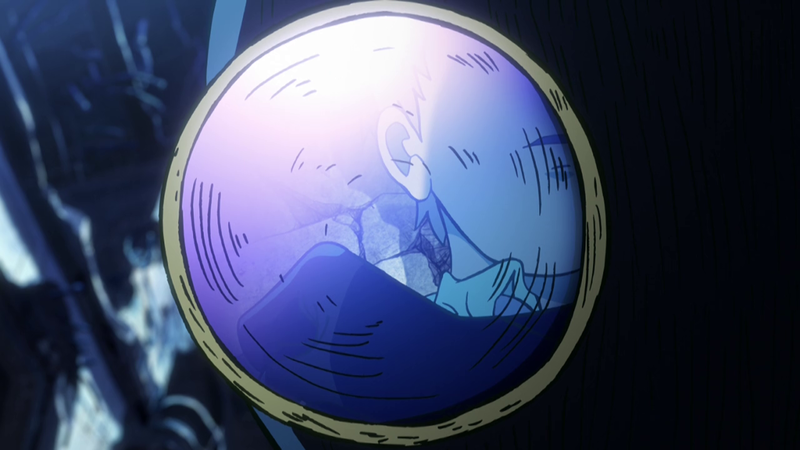 Next on the menu is the scene where Reigen repels Ishiguro’s black spheres. 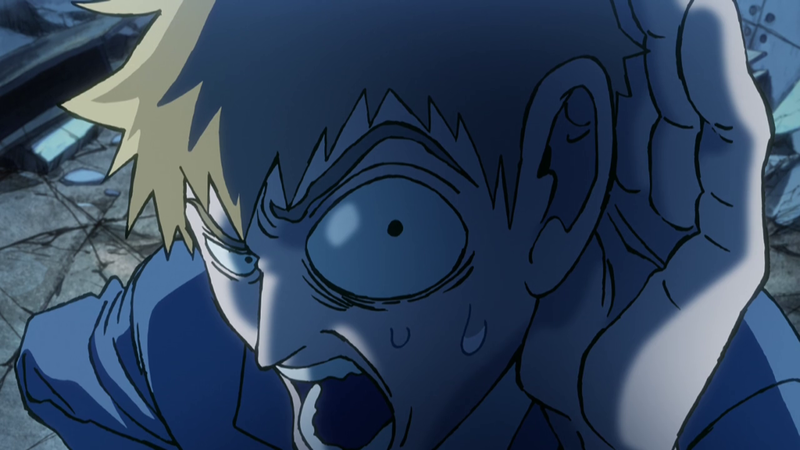 I don’t know who animated it, but I like how elegant Reigen’s movements looked there; it shows how powerful he was at the time and that it took him zero effort to fend off the attacks. Next come the more traditional action scenes. 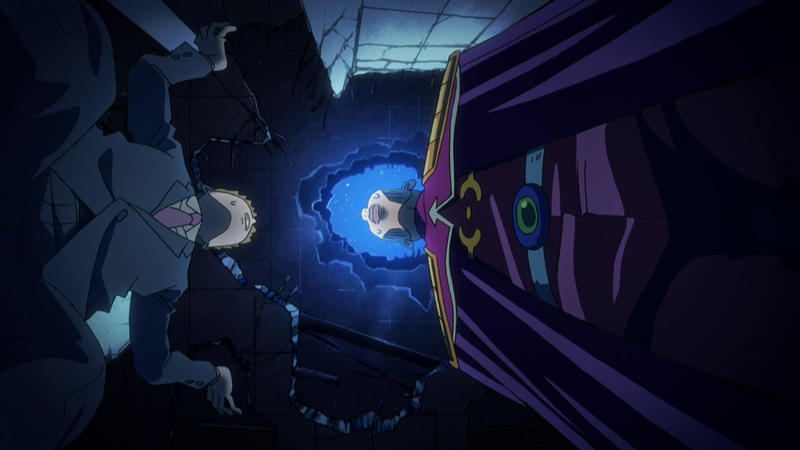 Ishiguro’s attack on Reigen was animated by Yuki Igarashi. 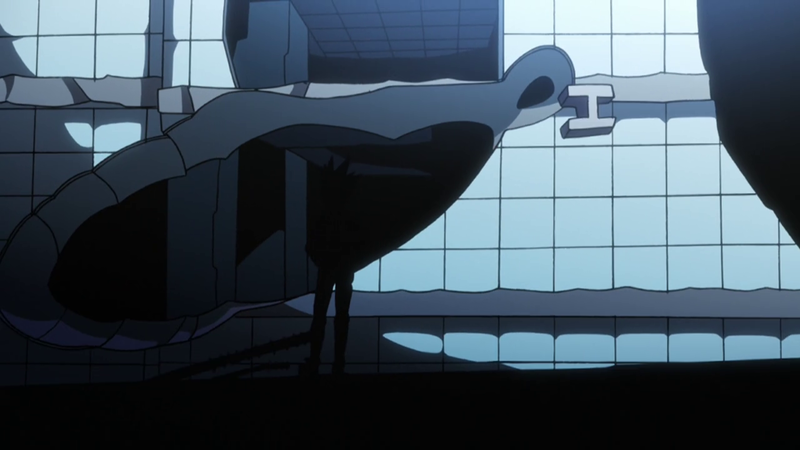 Unlike their past works, the scene featured lots of weirdly fun distortions and generally very snappy movement. It was the smoke animation that gave it away (and this tweet *cough*), otherwise the Kanada-style motion could have made it look like someone else’s work. 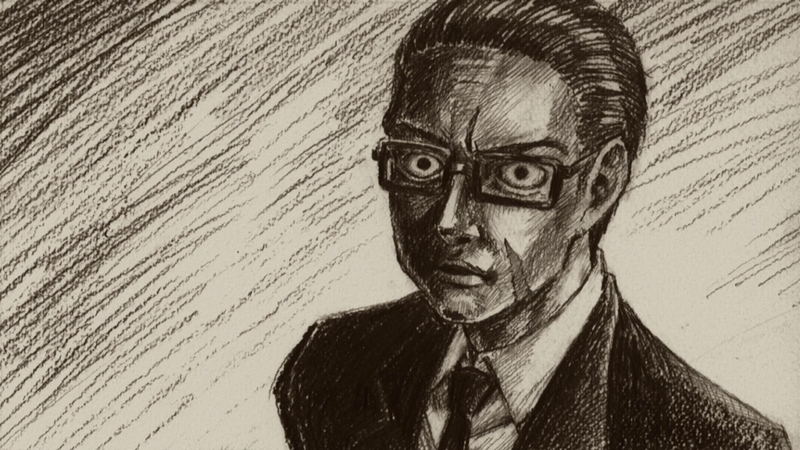 Ishiguro’s mental breakdown and his fight against Shou were animated by none other than Yutaka Nakamura – if you’ve been following the names of japanese animators for longer than a week, you’ve likely already figured it out. It was that clear, since as usual he made no effort to hide his very obvious quirks. Ishiguro’s emotive speech gave me some Man Gataro flashbacks, whom Kameda is very fond of. Worth mentioning are some amusing names that showed up on the 2nd key animation (aka clean up animation) list; amongst Mob Psycho regulars like Gosei Oda and Kenichi Fujisawa appeared Norifumi Kugai – talented animator who worked on Space Dandy, One Punch Man and is currently working as character designer on ACCA – plus Shingo Natsume, director of Space Dandy and One Punch Man who is also currently working on ACCA. Clearly the staff friendship here is strong. And that’s it, ladies and gentlemen. 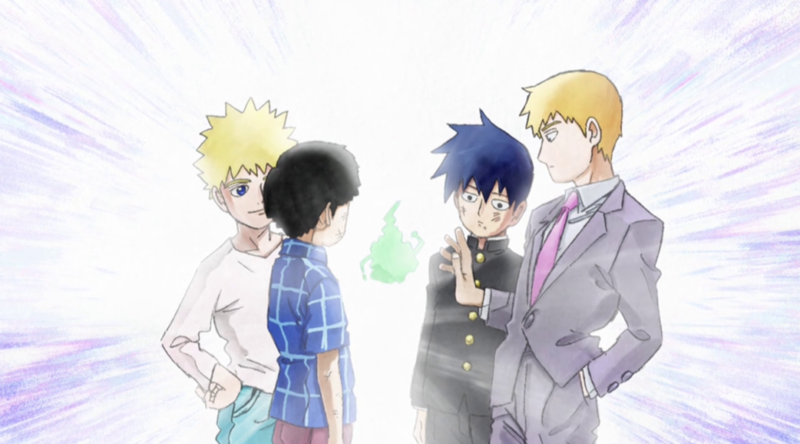 Mob Psycho 100 was a tremendously fun show to follow, and it has been a pleasure to cover its highlights weekly as well. I’m glad the show’s had such positive reception and I feel like as long as there’s enough demand for a second season, we’ll eventually get it – it seems obvious that the staff had a great time and would love to come back! For now I can say that I enjoyed it a great amount, and just a day after it ended I’m already missing it. Huge thanks to the production team that clearly poured their hearts into this work. It was worth it. And thanks to you for reading my writeups, whether it was weekly or just occasionally. I really appreciate it! See you next season – it’s time to flip flap!